Hey all you Coraline lovers!! This profile is a role playing profile about an amazing, intelligent, brave, adventurous, tomboyish, and also one of my favorite characters ever!! Coraline is one of my favorite movies ever created I just love it. 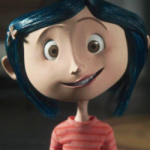 I'll mostly post stories and fan fiction about Coraline!